This hike begins on Forest Road #2110. The trail follows an old logging road for a short distance before it begins a very steep descent to Glacier Creek in the valley below. As you begin to descend you enter an Old Growth Forest. Nearly all of this hike is in dense forest. After reaching Glacier Creek, you don't cross it, but rather begin a very steep climb to Glacier Lake. At about 1 mile you may notice the sound of the creek changes. 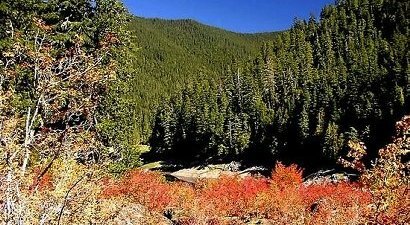 This is because Glacier Creek simply begins by pouring out of the ground very near the trail. Keep and eye and ear open for this unusual phenomenon. The reason for the unusual beginning of Glacier Creek is due to the fact that Glacier Lake was actually formed because of the collapse of the surrounding mountains. The debris filled up the canyon and the lake formed behind it. The water from the lake varies greatly in depth by season. The lake has no outlet as such. The water just seeps through the landfill that creates the lake, and all of a sudden appears as a creek. This is a relatively short hike, but a bit steep. It would be very difficult if the trail was wet. Travel east on US Hwy 12 for about 48 miles to Randle. From Randle travel east on US Hwy 12 for about 13.3 miles to the junction with Forest Road 21. Turn right (south) onto FR21 and follow it uphill for about 5 miles. 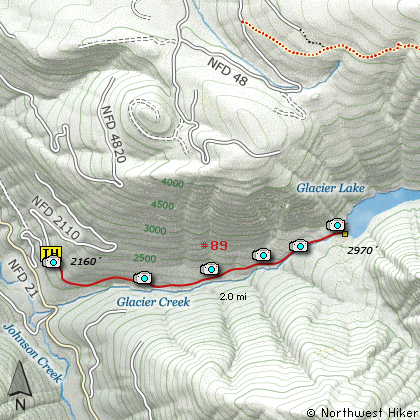 At this point you will see Forest Road 2110 on your left, which is the road to the Glacier Lake trailhead.